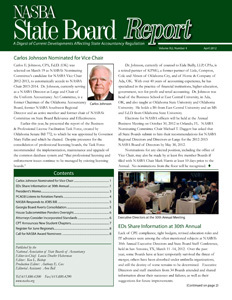 Lack of CPE compliance, tight budgets, revised education rules and IT advances were among the often mentioned subjects at NASBA’s 30th Annual Executive Directors and State Board Staff Conference, held in San Antonio, TX, March 11 -14, 2012. Over the past year, some Boards have at least temporarily survived the threat of merger, others have been absorbed under umbrella organizations, and still the destiny of some remains to be determined. Executive Directors and staff members from 34 Boards attended and shared information about their successes and failures, as well as their suggestions for future improvements. Merit raises have been eliminated in both Alabama and Kentucky. In Iowa over the past four years the Board has seen a 25 percent staff reduction and each year the Board’s budget has decreased. Forty-two percent of the Colorado licensees who had their CPE audited were disciplined for not meeting requirements. Maryland moved back to requiring candidates have 120 hours to take the Uniform CPA Examination and 150 hours for licensure, which resulted in a 55 percent increase in applications this year. Ohio Executive Director Ron Rotaru said he is proposing a similar move in Ohio. To meet its ethics continuing professional education requirement, North Carolina will accept behavioral or regulatory ethics CPE courses as registered with the NASBA Registry of CPE Sponsors. Virginia will be implementing a new fee structure in January 2013, the first change in 20 years. Beginning in 2016, universities in the state of Washington will be offering three-year baccalaureates to academically qualified students, without necessitating their enrolling in summer classes or carrying more than a standard full-time class load. Wyoming is encouraging their licensees to hold on to their original certificates in case they may want to reactivate them in the future; the Board does not have records for those who gave up their Wyoming licenses 15 or more years ago. Oklahoma, Georgia and Montana have been able to push back efforts to centralize their Accountancy Boards, but New Hampshire was merged, NASBA President Ken Bishop reported. According to press coverage, Alabama is considering consolidating all regulatory boards in 2013, Alabama Executive Director Lamar Harris noted. Legislation had been introduced in Tennessee that would bring the Accountancy Board completely under the umbrella of the Department of Commerce and Insurance. The latest information about the Accountancy Licensee Database and CPAverify was presented to the Executive Directors. Elizabeth Bachhuber, ALD Manager, showed a sample of the videos that have been prepared for State Board members, staff and other interested parties to explain how these projects work. Technical materials have also been prepared for these audiences. Currently 35 jurisdictions are live on ALD and 24 are on CPAverify, she reported. Rebecca Gebhardt, Compliance Services Manager, explained that the data feeds to the ALD site need to be kept current with the state’s updates of their own Websites. Disciplinary e-mail alerts are being sent by the ALD staff to the Executive Directors to let them know disciplinary action has been taken by a state that is providing data. In response to a request from the Executive Directors Committee, NASBA Chief Financial Officer and Vice President Michael Bryant presented an overview of NASBA’s finances. He reported that the financially strong organization built under Past President David Costello has allowed NASBA to now refocus on providing more service to the State Boards. The requirements of the IRS PTIN program and its relationship to the State Boards were described to the Executive Directors by Larry Gray, of Alterman Gray & Co., CPAs, LLC, a member of the NASBA Enforcement Committee. If someone prepares a tax return for a fee or for barter, even as an intern, the Internal Revenue Service considers him a paid preparer and he needs to have a PTIN (Preparer Tax Identification Number). The responsibility lies on the CPA firm to ensure its employees who need a PTIN have one. While the IRS is setting continuing professional education standards for unlicensed preparers, it is depending on the State Boards to have the appropriate CPE requirements for CPAs.